Spring Color Report is Here! It’s here! 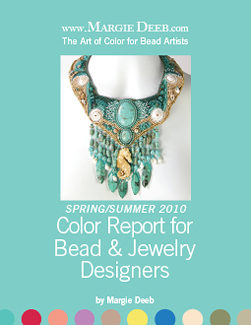 The Spring/Summer 2010 Color Report for Bead & Jewelry Designers. Pages and pages of glorious color inspiration and information for your spring and summer creativity. And guess what. My friend and fellow artist/author Jamie Cloud Eakin (Bugle Bead Bonanza and Beading with Cabachons) is giving everyone who purchases one a FREE bugle bead project PDF. You’ll receive a link when you purchase the Color Report. Thank you, Jamie. I’ll be writing more about the spring/summer colors in the coming days and weeks. I am often yanked aside by friends to help with color selection. So what I am saying is that I HEAR ya! I FEEL ya. And would you want to teach the Dallas Bead Society?